The Journal of Great Lakes Research published the study identifying Lake Erie bacteria that degrades microcystin. Before the 2014 Toledo Water Crisis left half a million residents without safe drinking water for three days, Dr. Jason Huntley’s research at The University of Toledo focused on bacteria that cause pneumonia. After the harmful algal bloom prompted the city of Toledo’s “Do Not Drink” advisory, the microbiologist expanded his research projects to target microcystin. Huntley’s research lab recently made major progress in his mission to create a biofilter that uses naturally occurring Lake Erie bacteria to remove microcystin released by harmful algal blooms from drinking water, reducing or eliminating the use of chlorine and other chemicals. “We’ve identified groups of bacteria in Lake Erie that can be used to naturally purify water. To our knowledge, these bacteria have not been previously used to fight harmful algal blooms in other parts of the world,” Huntley said. The microbiologists successfully isolated bacteria from Lake Erie that degrade the microcystin toxin known as MC-LR – the most toxic, most common and most closely linked to liver cancer and other diseases – at a daily rate of up to 19 parts per billion (ppb). Water analysts and toxicologists measure microcystin and other contaminants using the metric of ppb; one ppb is one part in 1 billion. These ppb numbers are important for human health because the U.S. Environmental Protection Agency recommends that young children not drink water containing more than 0.3 ppb of microcystin and adults not drink water containing more than 1.6 ppb of microcystin. None of the 13 microcystin-degrading bacterial isolates has been associated with human disease, so their use in future water-purifying biofilters is unlikely to be a public health concern. The identified bacteria include Flectobacillus major, Pseudomonas lutea, Agrobacterium albertimagni, Leadbetterella byssophila, Pseudomonas putida, Flectobacillus major, Pseudomonas hunanensis, Runella slithyformis, Porphyrobacter sp., Pseudomonas parafulva, Sphingobium yanoikuyae, Pseudomonas fluorescens and Sphingobium yanoikuyae. The research is published in the February issue of the Journal of Great Lakes Research. Researchers in Australia, China and other countries also have identified bacteria that can chew up and break down microcystin from algal blooms, however, Huntley said those specific types of bacteria were not found in any of his Lake Erie studies. Thirteen water samples used for the study were collected from visible algal blooms in the summers of 2014 and 2015 in the western basin of Lake Erie. The scientists added MC-LR to each water sample every three-to-four days for approximately four weeks, alongside a control group that did not receive additional MC-LR. The lab used multiple approaches to confirm the microcystin degradation results, including mass spectrometry and the ELISA test, which is the standard method water treatment plant operators use to measure microcystin concentration during algal bloom season. His lab is now in the process of identifying the enzymatic pathways the bacteria use to break down microcystin. Currently, municipal water treatment plants remove or degrade microcystin using methods such as chlorination, ozonation, activated carbon adsorption and flocculation. Huntley’s team is developing and testing biofilters – water filters containing the specialized bacteria that degrade microcystin toxins from lake water as it flows through the filter. Huntley holds a provisional patent on this technology. The research was supported by grants from the Ohio Department of Higher Education through the state’s Harmful Algal Bloom Research Initiative, which consists of 54 science teams at universities across the state seeking solutions to address toxic algae in Lake Erie. 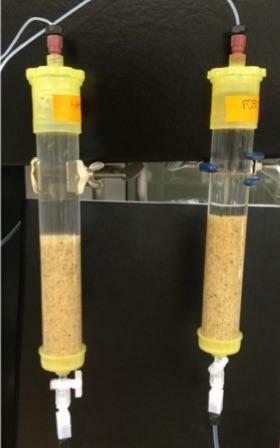 “This is another great example of how Ohio Department of Higher Education-funded research is producing solutions that directly benefit Ohio EPA and those water treatment plant operators responsible for managing our drinking water,” said Dr. Chris Winslow, director of Ohio Sea Grant and Stone Laboratory at The Ohio State University.